Netatmo, the leading smart home company for a safer and more comfortable home, unveiled its Smart Video Doorbell at CES 2019. With the Smart Video Doorbell, the user knows who is ringing their doorbell at any moment. The user can see the visitor on their smartphone and speak to them, responding immediately, even when they are not at home. The Netatmo Smart Video Doorbell also immediately alerts the user if it detects people loitering around the house. It is the first doorbell compatible with Apple HomeKit that can be controlled using the Apple Home app or by voice using Siri. The Smart Video Doorbell is also compatible with IFTTT, a platform which connects different apps, connected devices and web services. When a visitor rings the Doorbell, the users receives a video call on their smartphone and sees their visitor. They can choose to speak to them – or not – and immediately respond remotely from their smartphone whether they are home, in the office, or on the other side of the world. The user tells the delivery person where to leave a package when they are at the office, turns away salespeople without having to open the door, or welcomes guests while preparing dinner. Netatmo’s Smart Video Doorbell protects the home from intruders and helps the user feel safe in the event of any suspect activity. Thanks to people detection, the users knows in real time if someone is lurking around the front of their home. A precise ‘Person detected’ notification is received on their smartphone and a video of the event is recorded. Using the built-in microphone and speaker, the user can speak to the intruder and deter them from approaching their home. For added protection, the Security app alerts the user immediately on their smartphone when someone attempts to deactivate the Doorbell or remove it from the wall. The Smart Video Doorbell has a 1080p Full HD camera with a large 160-degree wide angle lens giving optimum video quality. The camera’s HDR function adjusts to sudden changes in light and allows the user to clearly see what is happening in front of their home whatever the lighting conditions. This means that visitor’s faces will be clear even against the sunlight. Netatmo’s Smart Video Doorbell protects the home day and night using infrared night vision. The user can always see the visitor at their door, even in total darkness. 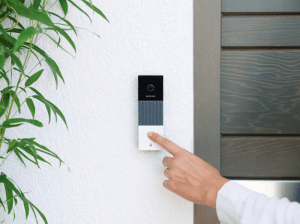 Netatmo’s Smart Video Doorbell will be available for purchase in the second half of 2019. Visit Netatmo at CES 2019 at Sands Expo, Booth #2104.